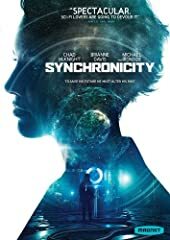 MY review for the new science fiction time travel film Synchronicity. I do like Blade Runner and Dark City. Good call. Will watch this. Neo noir is awesome. is it worth buying on blu ray if i have never seen it? I enjoyed your style of review… thanks, I will pass for now basis what you said…it’s on my saved list for now p.s. I loved Primer!! I loved The Signal, so I really want to check this one out. Also, was not a fan of Primer, just felt like a waste of time. SPOLIERS! WEEEE WOOOOOH WWWWSW SPOLIERS! I didn’t like the ending how each time he went back in time it was an alternative universe. They make you think it’s a causality loop, I’m not the biggest fan of those, but still. The ending does ruin the scene with the lighter. Because if we assume it’s all one universe that means he gave it to her, then she gives it to him, he gives it to her. Saying it’s from another universe does help ignore that if it was all one loop it would be breaking the 2nd law of thermal dynamics. Also the temporal feedback doesn’t work if he’s from a different universe. Dave 0 gets headaches because Dave 1 is near him because he’s getting temporal feedback (using the Movies logic) but that notion is thrown out the window when we learn its multiple Universes. I think it was supposed to be one universe but the writers didn’t want to have to deal with Paradoxs so they tact on the multi universe bit at the end. have you ever given a 5/5? Watch Southbound (2015)!! VOD. Horror-thriller-scifi. From the makers of VHS series! It’s great and really crazy/weird !! Played in many festivals..